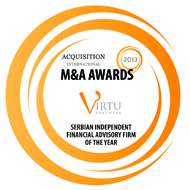 Virtu Partners is a Belgrade-based corporate finance advisory firm which operates throughout southeast Europe with a focus on the 6 countries of former-Yugoslavia. We leverage extensive personal networks to allow tangible local knowledge to be integrated with international best practise and thus to create a highly effective investment banking operation that bridges cultures, manages risks and maximises returns whilst maintaining clear and honest communication. Our Mission is to build long-term integration with our clients by delivering high quality, value-added, independent financial advice. Our success is not defined by this or the next deal but is measured only through building professional relationships that evolve into mutually beneficial partnerships. By providing objective financial advice we gain the trust and confidence of our clients, enabling them to turn to us at any time for direct, practical responses. We are proud that our trademark is fast and high-quality service. 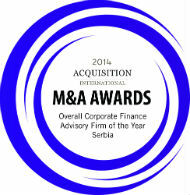 Maintaining absolute confidentiality about our clients throughout and beyond our engagements is non-negotiable. Professionalism on every project is driven by highly ethical principles based on integrity and fairness which are the core platforms of our contacts with clients. Our research partner is CEVES whom we co-founded in Belgrade to provide original economic thinking ad reliable independent research.